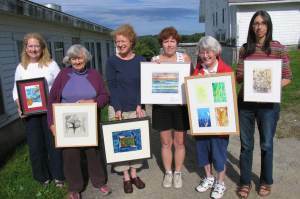 Faculty of the Midcoast Printmakers will be exhibiting original prints in a variety of techniques during the month of September at the Newcastle Square Realty office on Main Street in Damariscotta. The public is invited to meet the printmakers at a reception, including refreshments, on Thursday, September 8, from 5 – 7 p.m. Viewing hours for the exhibit are M-F, 10 – 5 and Sat. 9 – noon. Pictured below are Cynthia Hammett, Frances Hodsdon, Holly Berry, Debra Arter, Kay Miller and Delphine Sherin with work created by them that will be shown. Work in the exhibit will be for sale. Call Kay at 644-8849 or Debra at 563-7100 for more information about enrolling in classes.